No matter whether you’re a total beginner, never worn foundation in your life or are still struggling to find the right foundation for your complexion. Never fear. As there really is a foundation that’s perfect for every complexion and that will enhance it in a beautiful, natural way. Finding the right foundation shade is one important element of that. However, there’s actually so much more to it than that. There’s a lot of information out there that can be very overwhelming. But there’s also a lot of misinformation! And you can feel like you’re being sold to by brands when you’re not even sure if the products are going to be right for you! Trial and error are very costly! It costs a lot of money constantly trying out products that don’t work for you. But it also costs you time having to constantly search through Google for articles or spend endless hours searching for and watching videos on YouTube, hoping you’ll eventually come across one or two that have the right information that’s going to help you! But finding the right foundation for your complexion doesn’t have to be hard! And it doesn’t have to cost so much time and money to find it! Once you know how! In this online in-depth makeup course, I teach you everything you need to know about how to easily and confidently choose your perfect-for-you foundation. As well as the correct technique to apply it. My goal with this course is to save you all that time, money, confusion and overwhelm. So you can have everything you need all in one place. And so you can always refer back to it at any time whenever you need it. I’ve shared all my knowledge as a professional makeup artist with you so you can learn all of this for yourself. Because it’s so much better to learn this information for yourself so you don’t have to waste any more of your precious time or hard earned money on the wrong products. With my simple 4-step method you’ll ensure you choose the right foundation type and shade every time that will give you a beautiful, even, natural look that enhances your complexion. And makes you look refreshed, rejuvenated and more youthful. By the end of this course, you’ll have all the knowledge and skills you need to be able to confidently walk into any beauty store and choose the right foundation for your complexion. You’ll no longer feel overwhelmed or confused by what salespeople are telling you or by the hundreds of products available. The differences between each type of foundation and which is the right one for your skin type. The difference between coverage, texture and finish. And how to choose the right one for your skin type. 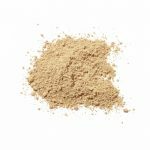 The terminology used on foundation products and how to use it to help you find the right foundation for your complexion. How to choose the right foundation type for mature skin. 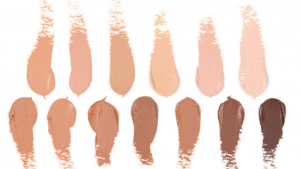 How to correctly choose the right shade of foundation for your skin tone. Whether or not you should change your foundation type and shade in Summer and Winter. How to update your foundation as your skin ages. 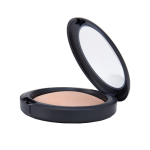 The ingredients to avoid in foundation products to avoid skin irritations and breakouts. Apply your foundation to ensure a smooth, even, streak-free and natural look every single time that will actually enhance your skin and make it look radiant and glowing. Know the correct foundation brushes or sponges you need to apply your foundation and how to use them correctly (it’s much simpler than you think!). A list of the best foundations for every skin type. These are some of my favourite foundations that I use on both myself and my clients. So I know how well they work. And they’re not only amazing quality. They all contain only the best natural, organic ingredients that are also good for your skin. And of course, they’re all 100% cruelty-free too. 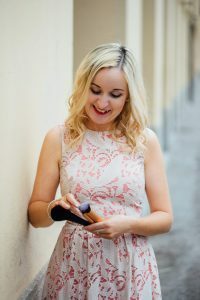 A list of my favourite beauty tools for applying foundation to always ensure a smooth, even, natural application of your fabulous new foundation that’s perfect for you. A checklist that you can fill and print out and bring with you every time you’re out shopping so you’ll know exactly what to look for. All the slides from the training so you can print them out, make notes and refer back to them anytime you want or need. A list of even more resources with plenty of tips & tricks that will help you even more. A 20-page Skincare guide to help you determine your skin type and that contains plenty of tips for every skin type. As a professional makeup artist, I’ve worked with hundreds of products and on all different skin types, skin tones and ages. So I know what products actually work (as well as what doesn’t!) and who they’re best suited to. And as I don’t work for, or am not affiliated with, any one particular brand, you can be safe in the knowledge that the advice I’m giving you is coming from a place of actually doing what’s RIGHT for YOU. Unlike the advice you’ll receive from department store salespeople who work for just 1 brand and only want to sell you products from that particular brand. Regardless of whether they’re right for you or not! You find it so hard to find the right shade of foundation. You’ve tried so many foundations and just can’t seem to find the one that looks right on your skin. You’re a total beginner and have never worn foundation ever before. You avoid wearing a foundation because you’re worried it’s going to look and feel heavy on your skin and look unnatural. You’re so confused by all the terminology and industry jargon when trying to choose a foundation. There are just so many to choose from! You get so confused by what the beauty counter salespeople are telling you. So you just buy whatever they tell you as you feel overwhelmed, confused or even pushed into buying whatever they tell you! 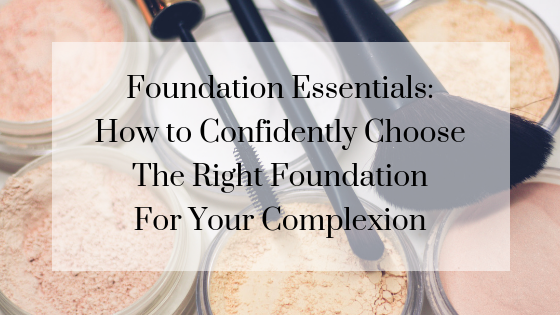 You want to finally understand how to choose a foundation so you can make an informed decision when you go to the drugstore instead of feeling overwhelmed and ‘sold to’! Your skin is starting to show the signs of ageing and you’re ready to transition from your current foundation to one that’s more suitable for your age and skin type. 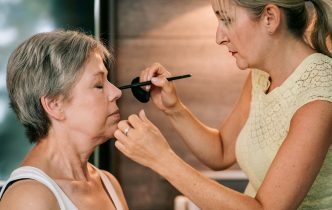 You have mature skin and you want to know how to choose the right foundation to enhance your complexion and give a more rejuvenated, youthful look. What happens once I enroll in this course? Once you’ve enrolled, you’ll receive an email from me with the details of where you can access all of the course materials. And once you have them, you can start this course straight away if you like. Or you can wait until you have more time to dedicate to it. Whatever works best for you. Either way, you’ll be able to access the course materials whenever you like and as often as you like. All you need to do is click on the button below to enroll in the course. How is this course different to what’s on YouTube or in blog posts? Sure, YouTube tutorials and blog posts are great. But it takes sooo much time searching through endless videos and blog posts trying to find ALL (or any!) of the information you actually need! This course will save you so much time watching endless videos and searching through articles (most of which aren’t even relevant to what you’re looking for!). As you’ll have everything you actually need all in one place whenever you need it. And as a professional makeup artist, I’ve worked with hundreds of clients of all skin tones and skin types. As well as having tried and tested hundreds of products. So I know what works. And what doesn’t! It’s a digital course. So once you enroll in the course, you’ll get immediate access to all the video content as well as all the bonus materials. There are plenty of pdf’s which are part of this course too. So feel free to download them and print out them out so you’ll always have them with you when you’re out shopping. You’ll have lifetime access to the course and all the bonuses. So you can view it as often as you like and need across all of your devices. The information will always be there for you. And in addition, you’ll also get any updates or bonuses that are added on at no extra cost. The course starts as soon as you enroll and doesn’t end. It’s a completely self-paced online course. So you decide when you start and when you finish. The training video runs for just over 1.5 hours and includes a practical tutorial and a Q&A session too. There are also plenty of bonus materials for you to view at your own pace. So allow approximately another 1.5 hours to go through all of those too. No. Whilst this is a great course for anyone who’s completely new to makeup or with little or no experience with makeup. It’s also great for you if you’ve been using makeup for a long time but you’re feeling totally overwhelmed by all the products out there. And would finally love to learn exactly what you need to know so you can find the right foundation for your complexion. It’s also great for you if you’ve been using foundation for a long time. But perhaps your skin is starting to show the signs of ageing. This course will really help you with that too so you can transition from the foundation you currently use to one that’s going to look much more flattering on your complexion. This really is everything you’ll ever need to be able to confidently walk into any beauty store or counter and choose the right foundation for you. Are you ready to finally stop wasting time and money on products that don’t work for you? And finally find the perfect foundation for your complexion?